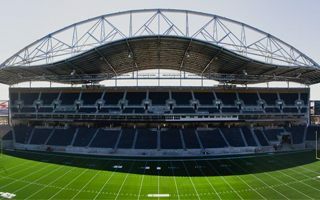 Triple B, the public-private company running Investors Group Field, filed a lawsuit against Raymond S.C Wan (architects) and Stuart Olson Construction Ltd. (contractor) for insufficient quality of the stadium. The operator had to pay nearly $5 million in repairs since hand-over and the total is likely to rise further. Last summer, an architectural firm was paid to examine the issues and generated a report that concluded that "during the design and construction of the stadium, there was insufficient attention to the management of water drainage and heating, poor execution of critical details and poor construction quality control." According to a release by Triple B, repairs underway during the winter include insulating the concessions stands that have fixtures and water pipes that cannot be allowed to freeze, but were built without sufficient insulation. "The private suites have consistently leaked in a heavy rain and during spring thaw runoff," it stated. "The suites were constructed with single pane windows and have minimal insulation making it difficult to keep the room temperature warm enough to protect the piping. In the stands, a lack of drains and concrete that slopes in the wrong direction allows rain to pond underfoot and pool in the concourse." Meanwhile the Progressive Conservatives suggest an audit should be carried out as to how the project was managed on behalf of the taxpayers. "Manitobans have too many questions and too few answers. When that’s the case it makes sense to go over the deal with a fine-toothed comb to see what happened," Heather Stefanson, the Progressive Conservative ‎critic for the City of Winni‎peg, said in a statement. She called on Kevin Chief, the minister responsible‎ for the City of Winnipeg, to call an audit.